Thank you for this post. Holidays are particularly difficult for me, and this one is no exception. I have had many “Easter Egg” moments in my life. Many have been since the loss of my Elizabeth, all of which I have referred to as “Collateral Beauty”(a reference to the movie…). I am truly grateful for these moments. Thanks again for making me smile! Happy Easter! I’m glad it helped, Kathy. 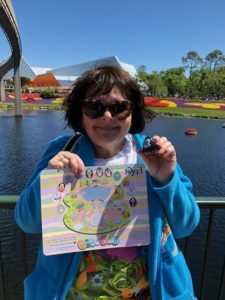 Also, as promised, I included the clue to the Easter Egg that we had trouble finding at Epcot. Unfortunately, I think today is the last day for the hunt! Happy Easter to you, my dear friends. What a cute story you had and still have. Thanks for sending this right on Easter. I really don’t have anything special but to say a very Happy day for you both today. God gave us His Son to give us salvation forever. What a gift this is! May God show His love to us on this special day. I loved the phrase “Easter egg moments”. A great metaphoric reminder to be aware of and appreciate those little moments of joy. Happy Easter to you! Thanks, Pat! Happy Easter to you!